Inkflow is a new handwriting and drawing app for the iPad and iPhone, and it has one standout feature: you can select, move and resize anything on the page. 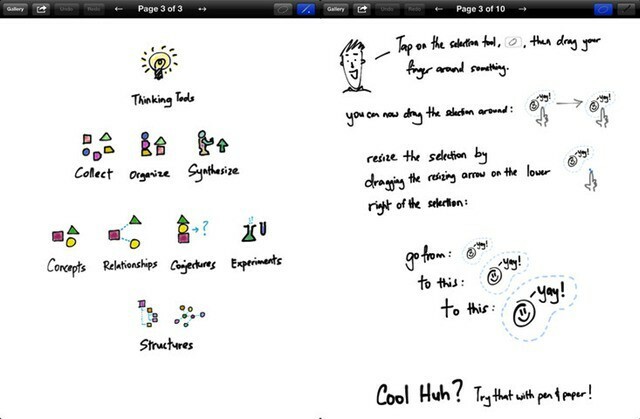 Inkflow is free, although to actually make it useful you need to buy the “plus” version via in-app purchase (iPad only). This unlocks colored ink, a brush and pencil (the free version has a pen), an eraser and cut/copy/paste. I like this model quite a bit, as you get to try the app out and buy it if you like it — just like shareware. The app itself is pretty good, with a top-quality inking engine, retina graphics and a clean, easy-to-use interface. The editing feature is also very intuitive: hit the “select” toolbar button and then draw around anything you want to edit. it gets a line of “marching ants” to show what you have selected, and you can move it, resize it and copy/cut/delete it with a tap. There’s also a great zoom feature — just pinch to zoom in and out, and the ink strokes act like vectors, so no matter how close you get, you’ll never see jaggy pixels. So how does it compare to the heavyweights, Penultimate and Noteshelf? Not too well. Both of these apps also allow page elements to be edited, and both are a lot more polished. Noteshelf even adds a close-up handwriting option and Penultimate costs just $1, and both have in-app stores to buy more paper styles. Still, Inkflow is certainly worth a look, and if you don’t mind the limits of the free version, it won’t cost you anything.